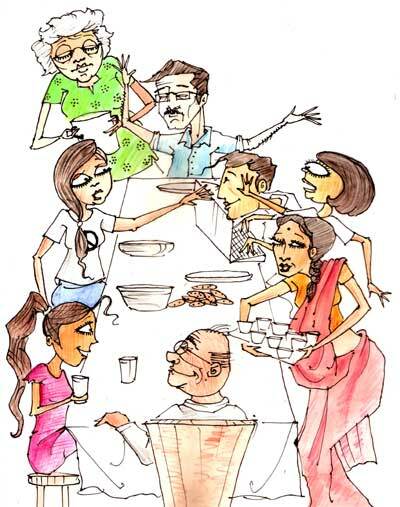 The Sathe family was sitting around the dining table chatting after Sunday dinner. A delectable one as always � Mom had created a Burmese khow suey, a noodle dish embellished with several side dishes including boiled eggs, fried garlic and crispy onion. The family was engaged in a lively discussion on a play they had just seen when Mom noticed that Aji was looking wan. �What�s the matter?� she asked instantly. Aji�s face creased into an expression of pain. �There�s a little pain here,� she said, pressing the side of her abdomen where the liver is located. �Aai, whatever it is, we are going to see the doctor tomorrow morning,� said Dad. Aai said nothing but her shuffle as she walked out betrayed her resistance. �Could something be really wrong with Aji, Dad?� asked Nisha, troubled. �It may be nothing, or it may be something, but the thing to do is to face it,� said Dad firmly. �The things we have to face have the potential for great and powerful growth, so let us always have the courage to face things, children,� said Mom. �Ok, Mom, there is something I have long been wanting to say to you both,� said Avijit seriously. Mom looked terrified. �Son, don�t tell me you are gay, or a drug addict or have decided to throw up your studies and go to Goa,� she pleaded. Avijit cackled with glee. �I knew you were not half as liberal as you think you are,� he accused her. �Relax and be grateful that you have children who will not send you to the grave with worry. No, I just have to face the fact that there is a girl who I quite like. In short, we are going steady, Dad,� he said in a rush. �Ok, ok,� said Mom. �It�s not easy being a parent, you know. And the teens. That�s the worst time of all.� �Face it, Mom,� cried all three in unison and the room erupted in laughter.